He tells Ceann Comhairle Seamus Kirk he was making a disgrace of his office by not allowing Enda Kenny to debate banking crisis. FINE GAEL TD Alan Shatter says he will not apologise or withdraw his remark that got him kicked out of the Dail for three days. I told the Ceann Comhairle that he was making a disgrace of his office. He said the Dail was then adjourned for 10 minutes and he was approached by Ceann Comhairle Seamus Kirk who he said asked him to withdraw his comment. Mr Shatter said that he had “no difficulty” in withdrawing his remark as long as his party leader, Enda Kenny, would be allowed to continue debating the banking crisis. His comment to the Ceann Comhairle had come after Mr Kirk had interrupted Mr Kenny in the Dail and said he could not continue speaking about the banking crisis during the Order of Business as there was time allocated for that debate later in the morning. Mr Shatter has been ordered out of the Dail chamber for three days, after which time his suspension is automatically purged without him needing to apologise or withdraw his remarks. He says he will be working in his office in Leinster House during his suspension. 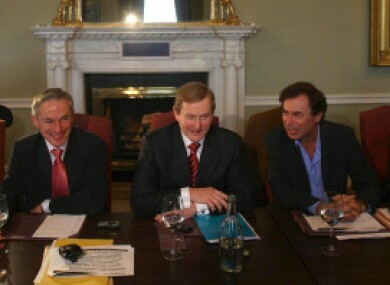 Email “FG's Shatter suspended from Dail for 'disgrace' remarks”. Feedback on “FG's Shatter suspended from Dail for 'disgrace' remarks”.